Welcome to the October Blog Hop with the Blogging Friends! Each month we choose a theme for our hop, and this month we’ve chosen to share with you some of our favourite new products from the Holiday Catalogue. Each of us is linked the the post that follows us, so to take the full blog tour, all you have to do is click on the ‘continue’ button at the end of the post, and you’ll be taken to the next in line. In case of technical gremlins (we all know they exist! ), I’ve added the links to all of the participants, so you can also click on those links to continue, or hop about at your leisure. My first project uses a Bundle that I knew I was going to buy, the minute I saw it! I admit, I’m tempted by a lot (okay, almost everything) in the Holiday Catalogue, but the simple elegance of the Detailed Santa Thinlits Die grabbed me! I started with a card base of Thick Whisper White cardstock; the extra sturdiness allows for the intricate die cut, as well as adding in the extra layers. First I die cut the front of the card, using the Big Shot with the Precision Base Plate. Trust me, this Plate is worth the investment – the cut pieces basically fall out on their own! I then die cut the mouth and hat in Real Red cardstock, the face in Blushing Bride cardstock, and the Hat trim & pom-pom in Dazzling Diamonds Glimmer Paper. I also cut an extra set of glasses from Whisper White cardstock. After the die cutting, I stamped the sentiment from the Greetings from Santa stamp set in Real Red ink onto the card front, then layered a piece of Real Red cardstock behind the die cut line at the bottom. The great thing is that you can Bundle the Detailed Santa Thinlits Die with the Greetings from Santa stamp set, and save 10%! Then I added a panel of Soft Sky cardstock behind the entire back of the card front (I hope that makes sense! the Soft Sky cardstock covers the Real Red piece at the bottom, on the inside). I then used the Tombow liquid glue to place in the extra die cut pieces into the appropriate spots; I used the Blushing Bride marker to give Santa rosy cheeks, and used the Dapper Denim Stampin’ Write Marker and White Gel Pen to give Santa his blue eyes. The glasses I coloured using the Basic Black Marker. 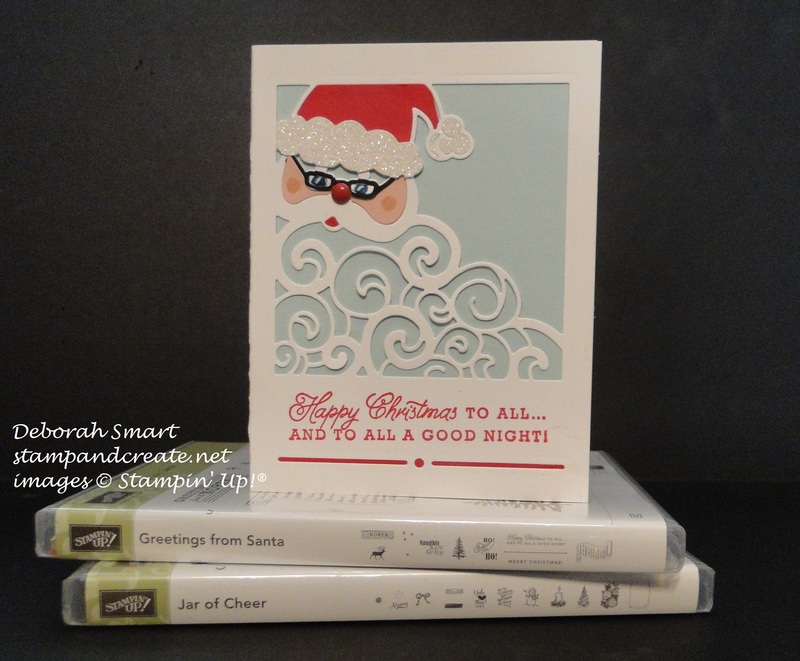 Of course, the great thing about this die cut is the different way you can use it; you can leave the Santa all one colour; you can use it to create a shaker card (that’s next on my list! ), or you can use it to create a Santa tea light holder, like I did with the Detailed Floral Thinlits (you can see that post HERE). 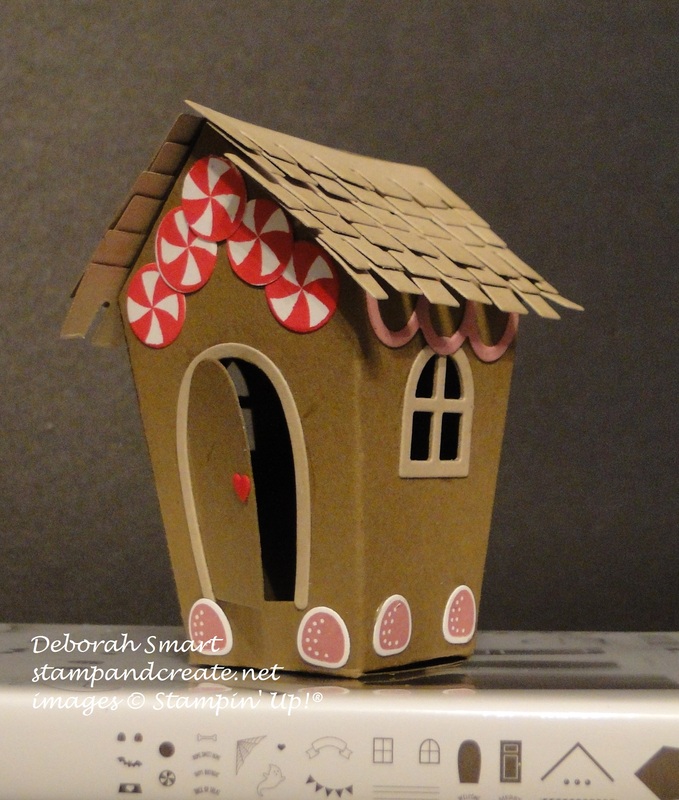 This adorable little gingerbread house is created using the Home Sweet Home Thinlits Dies, and I took advantage of an extra 10% off, and Bundled it with the Sweet Home stamp set! 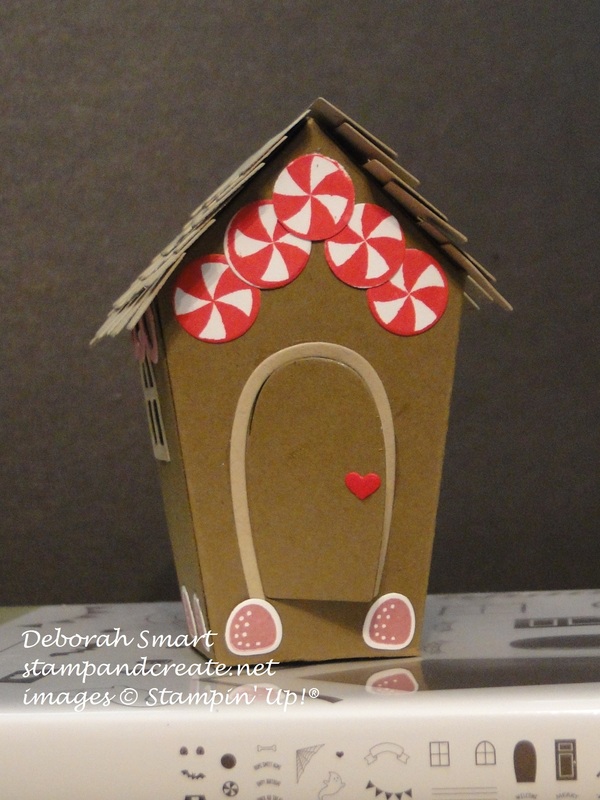 These little houses are so easy to make with the Thinlits; you die cut 2 of the houses, add your embellishments, and glue it all together! 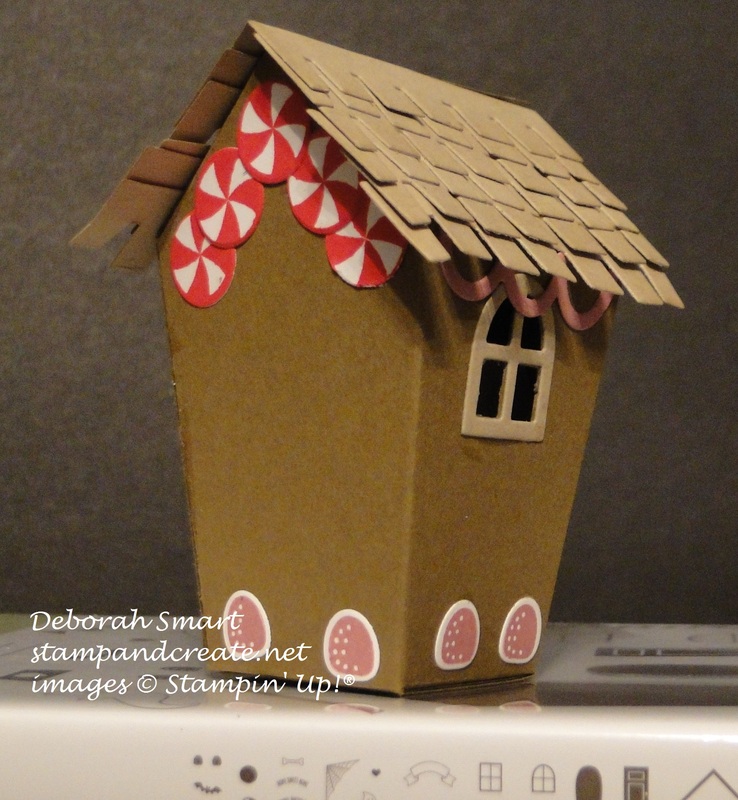 Of course you can make any type of house you like; the stamp set and Thinlits set make it easy to create houses for Christmas, Hallowe’en, and a Dog House. With your imagination, you can create a birdhouse, a beach house, garden shed – your imagination is the limit! I created my house using Soft Suede cardstock for the base, then added the trim around the windows & doors in Crumb Cake cardstock. The swirl candies were stamped on Whisper White in Real Red ink; there is a Thinlit in the set that you can use to die cut them, but I was getting tired, so I used my 1/2″ Circle Punch! The gumdrops at the bottom were stamped in Sweet Sugarplum ink onto Whisper White; I did use the Thinlit to die cut them! The little red heart is also a thinlit from the set, as are the shingles for the roof (cut from Crumb Cake cardstock). I think these will make terrific little gifts, stuffed with candies, and wrapped up in one of our Gusseted Cellophane Bags, and tied with some coordinating ribbon or Baker’s Twine! I know I’ll be making lots of them to sell at the Craft Fairs I have coming up this season! I think I was feeling a bit guilty for my lack of getting inky on my first two projects, so I made it up with this last one! This card doesn’t use any stamps, but it does use the Hallowe’en Scene Edgelits Dies. There is a coordinating stamp set, Spooky Fun, that you can Bundle with the Edgelits for the 10% discount, but since we don’t really ‘do’ Hallowe’en, I decided to just get the Edgelits. I think you can make a pretty good scene, without the stamps! I started with a 3 3/4″ x 5″ panel of Whisper White cardstock, and sponged Old Olive ink on the bottom, using a Sponge Dauber. (I could’ve used my Sponge, but I couldn’t find it!). I used my 1 3/4″ Circle Punch and a sticky note to create a mask for the moon; then used Pumpkin Pie ink with a Dauber on the top part of the card. Keeping the mask in place, I then added Elegant Eggplant ink with another Dauber on top of the Pumpkin Pie ink, keeping it darker at the top and edges of the panel. I then removed the mask for the moon, and used another mask (to protect the already sponged areas) and added some Daffodil Delight and a tiny bit of Pumpkin Pie ink to the moon, so it was so starkly white. Using my Big Shot, Magnetic Plate and the Hallowe’en Scenes Edgelits, I die cut the fence, the tree/grass, the witch and the tombstones from Basic Black cardstock. I popped them up on top of the sponged background using Stampin’ Dimensionals, and then used my White Gel Pen to add some highlights, as if the moon were lighting up some areas. I didn’t want to add a sentiment to the card front, as I think that the scene ‘says it all’! 🙂 I attached my scene to a panel of Pumpkin Pie cardstock, and then glued that to a card base of Basic Black cardstock. I hope you enjoyed seeing my projects, and that you’re as excited about the possibilities of creating with the products from the new Holiday Catalogue! I’d love to read any comment you’d care to leave, before you move on to the next post. To move forward and see the great projects Jessica Mink has created, just click on the Continue button below. If there’s a difficulty with the link, or if you’d like to hop about to the other posts, you can always click on the links in the entire list of Blogging Friends at the bottom. If you don’t already have a Stampin’ Up! Demonstrator in Canada, and would like to order any of the supplies used for my projects, you can click on the images below, and you’ll be taken to my online store. Thanks for spending time with me today – I know you’ll enjoy the entire Blogging Friends Blog Hop! Deborah Smart – You Are Here! Previous Previous post: Box Making Made Easy! Next Next post: I’m So Lucky! 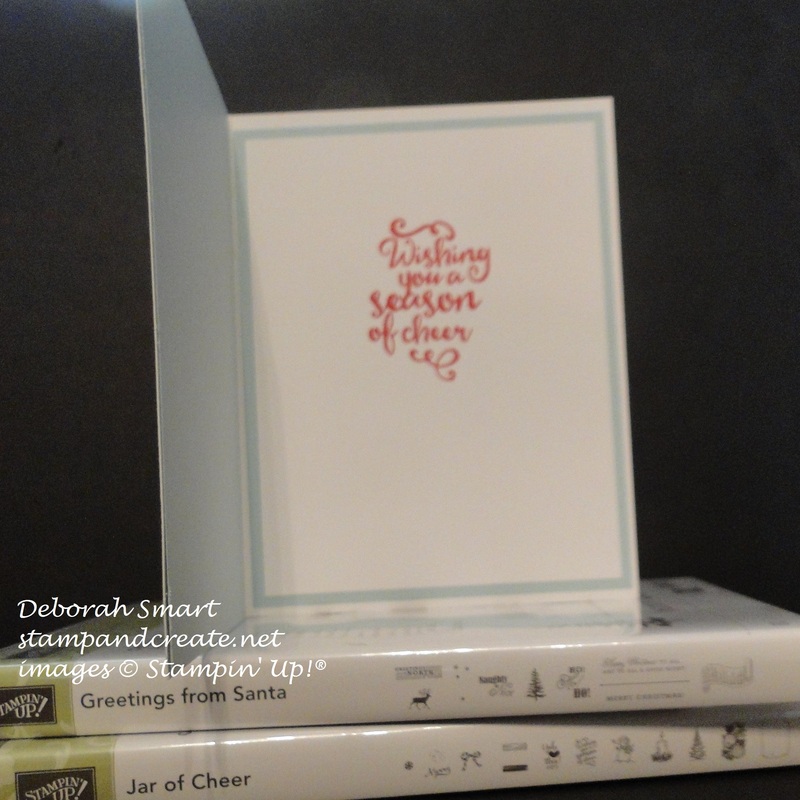 Scrap ‘N Stamp Background Check Blog Hop! I really enjoyed each project that you included in your post today. Such a great showcase of some of the best bundles from the holiday catalog. Thanks for sharing! Wow! Beautiful projects Deborah. You have been busy since you got home! Have a fabulous day! Awesome! Fabulous creations! I love how you changed up Santa to enhance his features. And, that gingerbread house, so very cute! Thank you for sharing! Love that little house, but the card is amazing!!! So many gorgeous creations Deborah! I love them all 🙂 The Halloween Scene you created without stamps is so cool! Great Job! I love your projects for todays hop! The Gingerbread house is a adorable. I really like you two cards as well. 🙂 You did an awesome sponging job on the Halloween card! All wonderful ideas Deb! I especially like the Halloween card! Really great holiday projects! I love that Santa thinlit great for wow Christmas cards. I also love the gingerbread house and Halloween card, both are on my wish list! Thanks for the kind comments, Tammy! I love how SU! tools (dies) allow us to make such fun & easy projects. 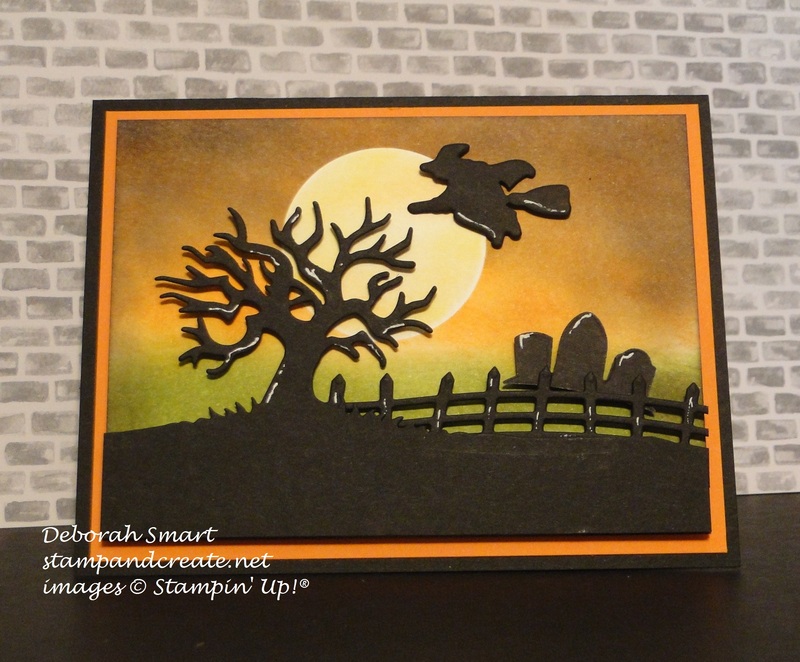 Love them all but your Spooky fun card is just stunning! Love the inked background! Our vacation was wonderful, but it sure was good to be back creating, Crystal! I love taking part in our blog hop 🙂 You really should get the Home Sweet Home dies – I can see me using them year ’round! Wishing I really had gotten these framelits to go with the spooky fun set….theres still time…right?! Seeing everyone’s projects using them is really inspiring. Great projects!!!! Scrap 'N Stamp Blog Hop Winners! | Stamp and Create on Scrap ‘N Stamp Background Check Blog Hop!